There are so many variations of Pressure Redistributing Mattresses on the market that do/offer different things it can be difficult knowing what to do. This blog highlights the importance of pressure redictributing mattresses and what to consider when selecting one. 1 What is a Pressure Ulcer? 2 Who is at risk of Pressure Ulcers? Often over a bony area eg ankles, sacrum. Caused by pressure or pressure in combination with shear, resulting to restricted blood supply to the tissue. Range in severity from skin discoloration to open wounds. Who is at risk of Pressure Ulcers? Those with reduced mobility and difficulties adjusting their own body weight are at higher risk of developing pressure ulcers due to pressure potentially being exerted on parts of the body for periods of time. This can lead to breakdown of skin and further health deterioration. They can be life threatening. 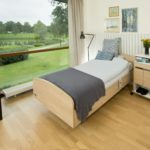 The risk of developing pressure ulcers can be reduced or managed by use of a pressure redistributing mattress, designed to redistribute as much pressure from the user’s bony prominences as possible. This should be undertaken by a healthcare professional and is often assessed using a standardised risk assessment which calculates a risk score such as the The Braden scale. This will indicate a level of risk and descriptions on the mattresses available usually correspond with this indicating which mattress is appropriate. Made from foam and often made up of geometrically cut surface cells therefore excellent for redistributing pressure whilst maximising comfort and reducing risks of shear and friction. Can be designed for high risk / very high risk, however some, such as Essential comfort mattresses are predominantly for those who may present with some minimal risks of pressure damage. Consists of individual alternating air filled cells, usually working as small groups to regularly and automatically alter distribution of pressure. These are activated by a pump which is usually hooked to the end of the bed and are suitable for those who are very high risk. Alternating pressure mattresses, sometimes called ‘dynamic’ mattresses may need to secured to the bed base using fixing/securing straps. Pressure redistributing mattresses can come as a mattress replacement or overlay which provides the same level of pressure care as their replacement mattress types but go on top of an existing standard mattress. The mattress may restrict transfer, which is particularly important to consider if the user usually transfers out of bed independently. Examine the impact the mattress will have upon their ability to continue to do so, including whether the mattress will alter the height of the bed potentially impacting upon the ‘sit to stand’ transfer from the bed. Consider which bed the mattress will go on and whether the mattress can be securely positioned, if not, an alternative bed may be required. Bed accessories may not be compatible with the mattress. For example; an alternating mattress should not be used with a separate profiling backrest as the backrest may restrict the air-flow of the mattress. Similarly if equipment such as a bed lever is required, this may be less beneficial to the user as a deep mattress will reduce the height of the bed rails, making them less effective and may cause an entrapment risk. A good night’s sleep is important in enabling everyday function, therefore if the mattress is uncomfortable and interrupting/preventing sleep, the impact of this may need to be weighed up with the risk of the pressure damage. It is a good idea to trial the mattress where possible so that the comfort of the user can be ensured. Selecting a pressure redistributing mattress involves many factors, often making it a complex decision. Following these 5 tips should ensure that aspects of pressure care needs are managed appropriately and other risk factors and considerations are taken into account.